It was like someone hit me in the head with a sledge hammer. We started the three week project during the hectic Christmas season knowing full well the clock was ticking its final seconds. Needless to say, I had my doubts, especially after the first night, a night that almost fell victim to a rush hour snowstorm. Sure, the nine boys gathered at the ready in the basement of the fire hall as the Morse Code specialist fired up his machine. Sure, they each brought their own hand made Morse Code device – some lighted, some using a beeping device. But none of these young boys had ever heard Morse Code. If you’re older than forty, it’s tough not to remember watching an old World War II movie that didn’t have Morse Code. For some reason, the story of the Titanic reverberated within the skulls of our generation, and that story cannot be told without the incessant dot-dot-dot dash-dash-dash dot-dot-dot of the plaintive “SOS” sent by the ship’s radio operator. Indeed, if memory serves, I think knowing how to signal SOS using Morse Code was a graduation requirement for third grade. Well, the realization of the boys’ total unfamiliarity with the simple synchapation of Morse Code that night knocked me over like a cold slap on the face. These boys merely stared at each other unknowingly when asked to show the Morse Code signal for SOS. Mind you, these kids aren’t dumb. They quickly picked up the Morse Code translation, (now taught with di’s and dah’s instead of the dots and dashes us older folk might be used to). However, when asked to use their devices to spell out a simple sentence in Morse Code, they tapped out a fingers-on-the-chalkboard cringing lack of percussive coordination I last heard in some avant garde John Cage piece. They never heard Morse Code (or, presumably, John Cage), so they didn’t know the memorable beat we learned from all those aforementioned movies. They didn’t have the sense to pause between letters and words. 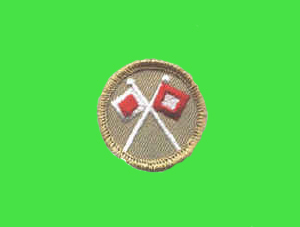 All I could think of was the hopelessness of their attaining this rare historic merit badge. To my surprise, the boys not only absorbed their three weeks worth of training, but did so with extreme fun. By the third week, they were sending themselves Morse Code messages non-stop. They even told jokes in Morse Code. What amazed us dads the most, though, was their quick ability to read Morse Code using light – not sound – signals. Us elderly codgers, perhaps saying more about ourselves than about our sons, didn’t think they could interpret light as fast as sound. Lo and behold what did we find but they picked it up and then some. At one point I suspected they were simply memorizing the same words, so I (feebly, mind you) sent an unrehearsed message to test them (the message involved sending me money). They got it faster than I could press the button on the flashlight to signal it (though they did fail to carry out the order of the message). In the end, the experience proved a pleasant surprise. Eight of the boys completed their merit badge (one dropped out after the first week). Not only did they become skilled at something new, but they got to taste a part of history as the adults, in turn, shared stories of how they first learned Morse Code. And, more importantly, these boys really discovered a lost art not from the era of their parents, but from the age of their great-grandparents. The pleasant satisfaction of passing on this legacy hit me with the force of a sledge hammer and pounded a contented smile on my previously cynical face. Wow. I love this job.